When Shenise Farrell read on the internet about a £5,000 operation which could turn her dark brown eyes light blue, she wasted no time in heading off to Panama. Less than two weeks later, British surgeons were battling to save her sight. They had to repair a hole in her iris and remove implants. It is unclear whether she will suffer long-term damage – and her eyes are still brown. ‘It was the biggest mistake I have ever made,’ said the single mother of three from Perivale, West London. 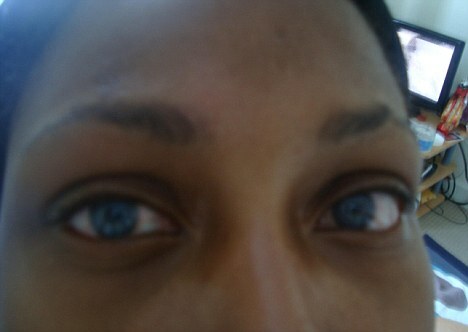 Let me first say, I don't think it is wrong to wear colored contacts, it's all about motives. I worked with this really dark-skinned Mexican guy who wore blue contacts everyday. I thought is was the most unattractive, bizarre thing for a "heterosexual" male to do. The other people of hispanic heritage there explained how he tried very hard not to be Mexican. He would even go as far as telling the spanish-speaking customers that he did not know spanish, when clearly he knew some. This article begs the question, what was the motivation behind such a risky act. She could have gotten the same effect with Beauty Supply store contacts. LOL They don't even look natural. Oh well. I am really out of words. SOOOOOOOOOOOOOOOOOOO. . . Girl, I don’t get it. That color looks ridiculous on her. I am afraid to get LASIK which I need, let alone some unapproved inserts. This is so sad reminds me of the Bluest Eye. It ios sad but she is not alone. Another black lady went to Panama and did the same procedure but she is keeping her lenses. Go B. has the youtube video on her site. I went to youtube to read the comments and still with secondary glaucoma there are some comments stating that she has pretty eyes, etc. Cutie Pie, I agree with the Mexican people you work with. Unfortunately, there are still Latins amongst us who do not embrace their culture and their heritage. She said it meant he couldn’t deny being Mexcian if he wanted to but still he tried. I was trying to think of an equivalent analogy for African Americans, but can’t. I never understood the not speaking spanish thing. I have been trying to learn spanish for years. It’s a beautiful language. That and French. IMHO.